I have a dedicated studio space on the main floor of my house, but it’s not really set up for painting large canvases, so I cleared out a nook in the basement that would accomodate the larger scale artwork, plus space for a comfy dachshund bed. That was my view during most of the 1.5 weeks that I spent painting up a storm in the basement. Well, truthfully, Otto was my most faithful companion, hanging out with me until the wee small hours, but Kasi also joined us quite a bit. As I mentioned before, I painted 10 canvases for Artomatic. They all measured 30x30in square, and I painted them all with black and/or gray on a white background. Although the painting all took place over the course of a week and a half or so, I spent a lot more time than that sketching and figuring out my game plan. The average painting size I worked on before tackling these big ones was about 6x6in. Sometimes a little bigger, sometimes a little smaller, but for the most part I stuck with painting in the way I was comfortable: with a teeny tiny paintbrush on small bits of paper. I started out by testing out larger paint brushes on paper. I quickly discovered that this wasn’t going to be as easy as I thought. The brushes I had were all too floppy, or too stiff. I needed something that was specifically made for the way I would paint. My friend Krissy suggested I look into Liquitex Freestyle brushes. I did some research and watched some demos, and they seemed like they would be perfect; or at least give me a fighting chance. I went to the art store and carefully selected a variety of shapes and sizes I thought I would use. While I was checking out, I casually looked at the display they had under their glass counter. As they scanned my items, swiped my card, and I signed my name, my wheels slowly started turning. What was I looking at? Paint markers. After a closer look I noticed they were acrylic paint markers, made by Montana–a company I recognized as making high quality acrylic spray paint. After paying for my paintbrushes, I asked if I could see one of the markers. Maybe a black one and a white one would come in handy for touch ups. Then I noticed they had some thicker tipped markers as well–and they even had a couple of gray markers! It didn’t take long for me to decide to go ahead and buy a few to try out. I just had this intuitive feeling like they would really come in handy. It’s an understatement to say that I was glad that I got them. These markers are probably one of the best things I’ve ever bought. They are so much better than any other paint marker I’ve tried before. The paint is water based, runs really smooth, and most of the markers are refillable. In fact, even the ones that aren’t technically refillable can be converted to refillable with a drill and some duct tape! I tried them out on some of the sketches I’d started with a paint brush and was blown away by the accuracy that was immediately available to me. What a difference! This was just what I needed to pull off my vision for Artomatic! Truly a godsend. Today I am 100% proud to admit that all the following paintings were created entirely with Montana acrylic markers. They are a fantastic product. I like to think of it as painting with a felt brush. You can get such a precise edge, as well as more painterly effects. While I’d still like to practice and get more proficient with brushes, I have a feeling these markers will always be part of my repertoire. For my paintings I used their pre-mixed Shock Black, White Pure, Gravel, and Iron Curtain, and mixed one custom lighter shade of gray myself. I didn’t pause to take any in progress shots of the first painting I created. I was so “in the zone” I just worked until it was done! With no time to pause too long to admire my work, I started on the next one, drawing in all the black lines. I actually let the above painting sit overnight as I contemplated what to do for the background. Eventually I chose to add texture with the lightest gray shade, over only part of the background. The next painting was the first one where I worked in specific layers, one color at a time from lightest to darkest. I’ve done similar drawings like this before, and usually I work from top to bottom, drawing the shortest swooping lines first, then adding the longer scallops as I continue. Since the paint is opaque, I had to work backwards. The next painting was somewhat ambitious, but I loved the sketch I did so much, I had to go for it and see if I could make it work. Indeed, my first attempt ended in disaster. It was such an odd thing that happened. I was in the middle of painting the black outlines when I happened to notice that the cap on my wide tipped dark gray marker was not closed all the way. I was afraid it would have dried out, so I grabbed it and pulled the cap off. Far from being dried out, paint had actually collected in the cap, and when I yanked it off, I flung that paint right onto my canvas. I then panicked and grabbed some paper towels and tried to wipe off the paint. This not only smeared the drips, but also some of the lines I had drawn. In a last attempt to salvage part of the painting, I tried to gesso over just the section that got splattered, but I hadn’t let the black outlines dry long enough, so the gesso smeared it, turning that whole section a dark muddy gray. Live a learn: when you accidentally fling paint on your canvas remember to dab, don’t wipe! Also, when you open a paint marker, be sure to hold it well away from the surface you are working on. I felt a little disheartened, so I put that particular design aside for a day and worked on the next painting. I did come back to it the following day, and the second time was the charm. I steadily worked on the black outlines, then carefully filled in some of the sections with dark gray. The next painting is a little different from all the others. I started by blocking in big areas on the canvas, using the two lighter shades of gray. I used the wide tipped markers for each of these large areas which helped create a really nice background tone and texture for the detail lines I added later using the fine tipped dark gray marker. Next up was another layered painting, which actually took quite a while to complete because not only did I have to wait for each color to dry, I actually did two layers for each color–one layer was a basic all over background coat, and when that was dry, I came back with the same color and added a texture overtop to suggest that the shapes are either feathers or leaves. I think you can see that texture best in the bottom right photo below, especially in the middle-gray tone. For most of the paintings, I worked out the sketch in my sketchbook first, then projected that image onto the canvas and traced over the lines with a watercolor pencil to make sure I got the proportions right. For the next painting, I worked in a much more spontaneous way. True, I had an initial “sketch,” as you can see in the upper left corner in the image below, but I didn’t trace the shape of the lines onto the canvas. Instead, using the sketch as a reference, I worked freehand, painting in the lines directly onto the canvas. Once I’d gotten the initial six curved lines in place, it was just a matter of waiting for the paint to dry so I could thicken the lines until they felt right. I had to do this about 5 or 6 times–thickening the lines, then letting it dry before filling it out more–because if I tried to go over wet lines with wet paint, it would scrape some of the paint away and start to clump up. Patience was key with this painting, and in the end, I think it really paid off. It’s definitely the boldest of the bunch, and also the only one that uses black exclusively. Painting #8 was up next, and I knew I wanted to do something in this style all along. Drawing a grid on a canvas that is not perfectly square is quite a challenge though, so it was a while before I worked out a grid that looked even which then provided the framework for this design. Once I got the grid set up, the painting went pretty smoothly, although I admit it took a long time. There are lots and lots of lines on that canvas! By the time I was almost done I was eager to get the paintings finished up, so I didn’t take as many photos in progress photos, starting with painting number 9 (pictured below on the left). This particular painting came together rather quickly. 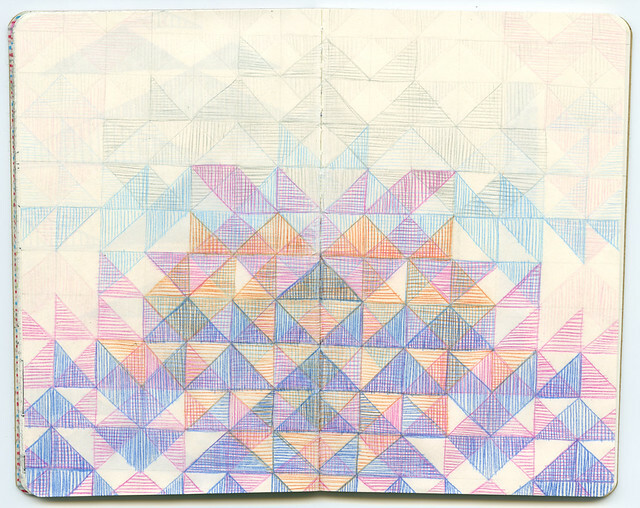 I did transfer a sketch to get it started, but when I began drawing the lines, it took on a life of its own. The line work is a lot looser than I intended. In fact, when I first finished it, I wasn’t 100% sure I even liked it all that much, but it grows on me more and more every time I see it. It definitely adds a light and energetic element to the group of paintings. The last painting I did is not quite finished in the image below (right), but again, I think we’re lucky I took even one in progress photo! I had quite a few ideas for what to paint, but for most of the paintings, I made the decision when it was time to start a new canvas. The page above shows some of the many (30+) thumbnails I had for potential paintings, and various deciding marks as I considered some paintings and ruled out others. There are a few ideas that I thought for sure would make it onto a canvas that didn’t make the cut, and also a couple that I didn’t initially consider that did earn a spot in this group of Artomatic paintings. While I worked on paintings, the area next to my easel was always cluttered with pencils, markers, paper towels, sketches, tape, paint, and more. Somehow, even with a creative mess around me, and a few setbacks here and there, I managed to keep on track and finish all 10 paintings in time to get them installed for Artomatic. In fact, here’s a little sneak peek of my paintings on the wall. You can see my space through a doorway off one of the main areas on the 1st floor. All the walls in that main space are covered with either art or graffiti murals, but I think my display has a good chance of catching people’s attention, don’t you think? I will be posting, probably tomorrow, with images of the final wall. I even took some non-instagram photos, so you can get a good idea of what the space actually looks like without weird filters distorting it. If you made it this far, thanks for reading this exceptionally long post! Do you have a favorite painting of the 10 created? When I signed up for Artomatic, I had no idea what I would actually present there. I wanted to wait to see what my space would be like before making any major plans, since I knew it could be anything from a 6′ to 20’+ space. As I mentioned in my previous post, I got an awesome 17′ wide 9′ high wall. After contemplating a few ideas, I settled on one: 10 big paintings, all black and white, on an incredibly brightly colored wall. I considered both red-violet and pinkish-orange, but the pinkish-oranges on the paint samples at the hardware store were brighter, so I chose the brightest called “Lipstick” by Behr. The wall itself was in pretty good shape, with only a few holes, but there was a cable conduit that I wanted to remove. Unfortunately when I did so, it took big chunks of the wall with it. This actually turned out to be a blessing in disguise, because I hadn’t realized that the walls were concrete before then. I would have showed up with nails to hang my paintings, and I would have been disappointed. I went ahead and taped off the side and bottom edges. Then I hopped on my little footstool and reached up to the ceiling. That’s when I realized I wasn’t going to be able to tape the top edge of the wall! I’m pretty tall (about 5’10”), but my fingertips just brushed the ceiling when I stretched. I didn’t have the accuracy I’d need to tape off the edge properly, so I grumbled a bit as I realized I’d have to come back another day. Not to be slowed down, I went ahead and painted what I could. I started like a normal person, painting in the edges with a brush. Then I had the bright idea that some of the cracks and holes could probably use an extra coat, which would be best done first, so I did that. I thought the idea was sound, but after I was finished, I talked to a couple of artists who were hanging their work across the way from me and they wondered what my strategy was in painting all over the place with no apparent pattern. At one point they thought I was perhaps painting a mural! Haha. Maybe I was also trying to break up the monotony of painting edges? Yeah, looking at my progress, I kind of see why they were wondering what my mural would be about. In any case, I kept diligently working, making progress on the edges and the cracks and holes. Then something wonderful happened. A guy came along who was a great deal taller than me. We got to talking and he offered to tape my ceiling line for me! Yay! Thanks to him, I would be able to finish the wall in one day! Indeed, eventually I was almost done! And then I was pretty much totally done! Just had to clean up! When I was finished and had cleaned up the space, I was so proud of my hard work, I decided to take a self portrait with my brand new brightly painted wall. First, of course, I had to set the self-timer. Then I actually set the self timer, and I took a super cheesy photo of myself doing jazz hands while wearing my painting pajamas. Although sweaty, tired, sore, and a little dehydrated, I felt very accomplished. At this point I had about 1.5 weeks to start and finish 10 paintings and get them up on my awesome, bright wall. No problem! 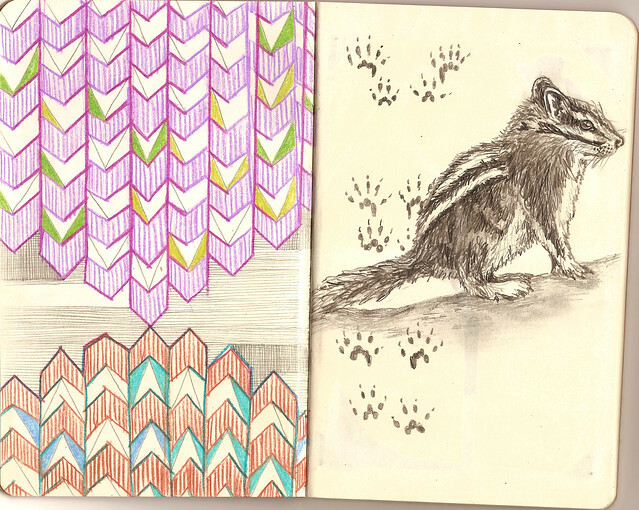 After many weeks… well, ok, after many months, I finally finished up my second round with the Patterns & Paws sketchbooks that I first posted about waaaaaay back in September. 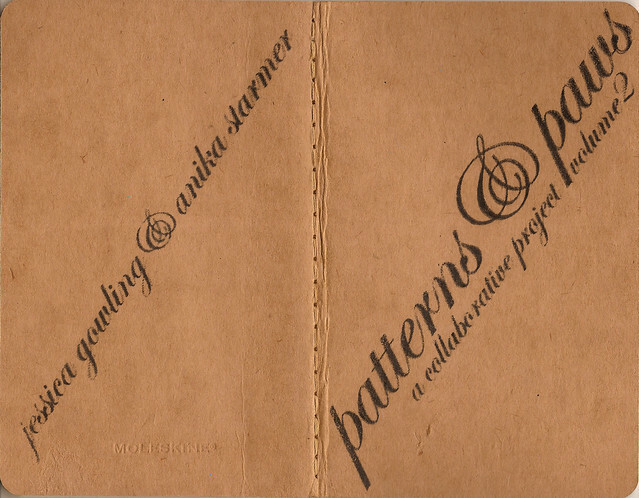 If you don’t know already, Patterns & Paws is a collaborative project I’m doing with fellow artist, Jessica Gowling (@jessicagowling on twitter). 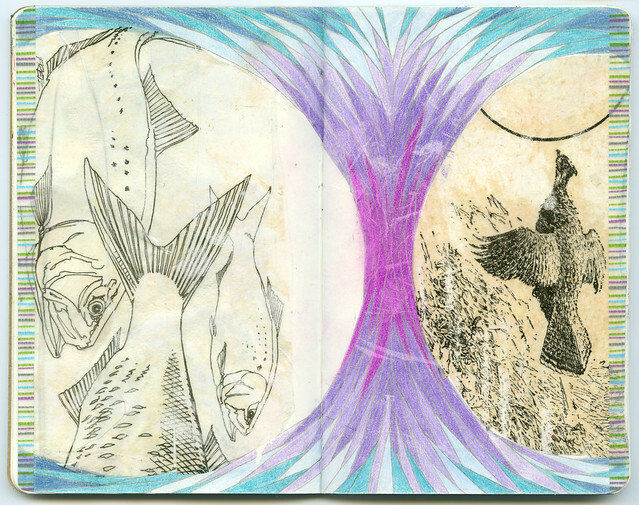 If you’re not familiar with the ins and outs of this project, it does have a few “rules” that we both follow about the order and placement of our art within the two sketchbooks. You can find out all about the project in Jessica’s thorough introduction on her blog. I think the holidays got in the way a bit, not to mention a lot of freelance web design that came my way, but excuses aside I finally managed to finish up my turn and send the books back to 100 Mile House, BC to reunite with Jessica. I would also like to mention that my tardy reply had nothing to do with lack of inspiration. Jessica added some real gems to the books that left me overflowing with ideas. 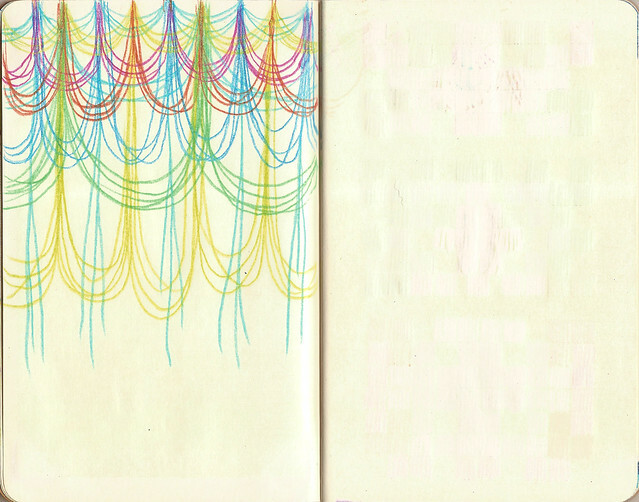 First I want to share the pages that Jessica completed after I’d started off the spreads. Aren’t her additions awesome!? I was so excited to see how my drawings inspired what she chose to add. Each spread was such a delightful surprise to discover. The next images show the pages she started for me to complete. 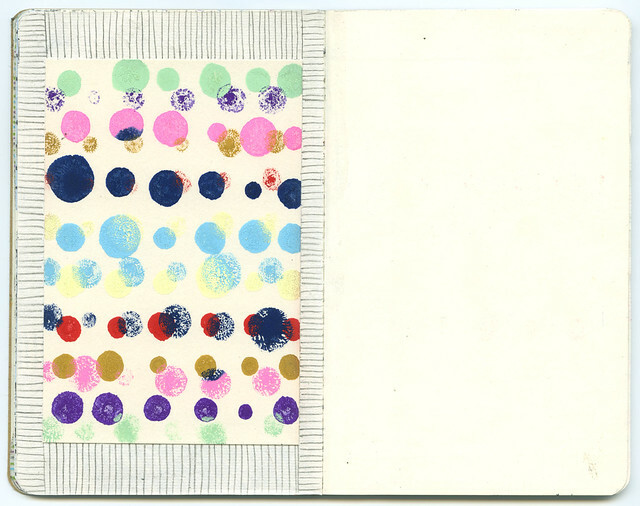 When I got the sketchbooks, I worked on these pages first, taking inspiration from Jessica’s compositions. 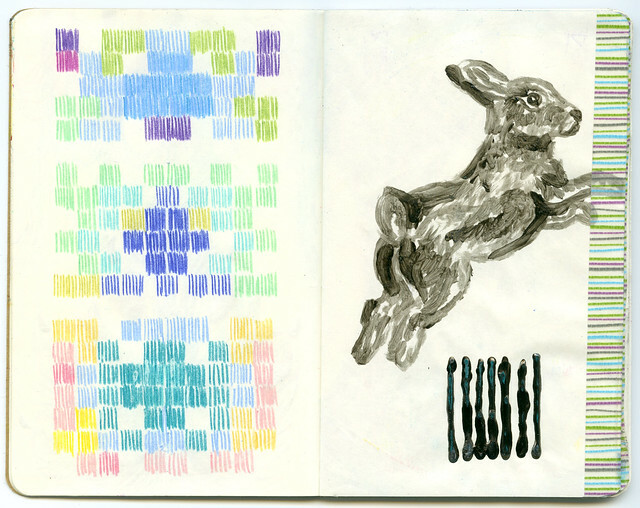 Jessica started off these spreads by creating a checkered pattern filled with various fur and skin textures. 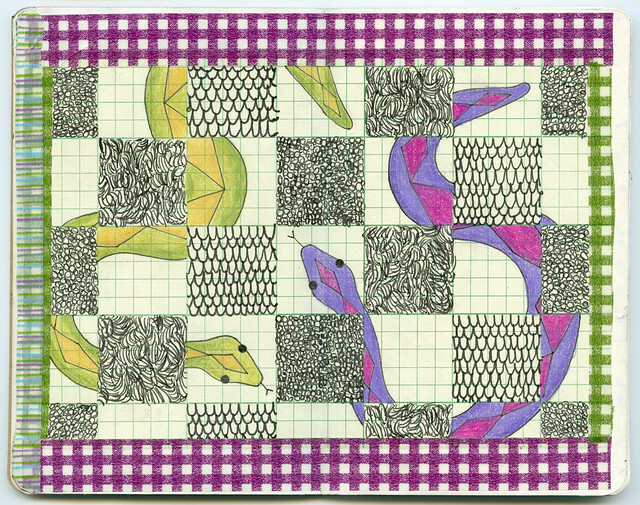 I immediately knew I wanted to somehow weave an image through the “open” squares, and since her textures reminded me of little critters, my mind eventually wandered to snakes eating those little creatures, and an idea was born. I actually did quite a bit of sketching to work out the composition of this one since I really wanted the illusion that the snakes were under the pattern to work. 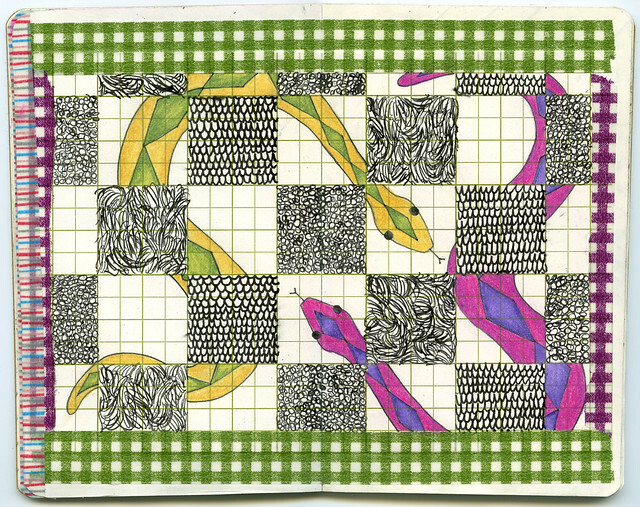 The colors of the snakes were inspired by the washi tape Jessica framed the pages with. I was super inspired by these pages. 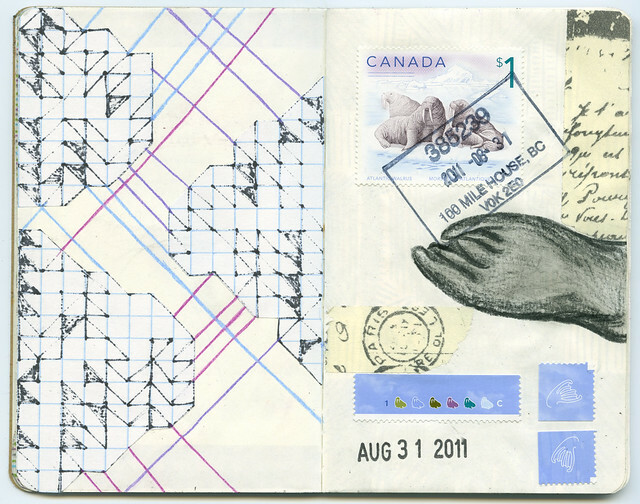 I love the collage-iness, the stamps, the inkiness, and the colors. I initially intended to use rice paper for the collaged elements. When I drew on the rice paper, I laid it on top of grid paper to use as a guide. The ink bled right through the rice paper, and I was delighted to discover the blotchy drawings on the grid paper. They harmonized so much better with Jessica’s collage that I didn’t give the rice paper a second thought. The shapes I used were inspired by the environments of the deer and walrus, as seen in the stamps. I added colored lines to connect the shapes which created a greater sense of atmosphere and helped balance the left and right pages with each other. It’s hard to say that one set of pages is a favorite, but boy do I love these. I’m going through a significant gray phase in my art lately, so when I saw Jessica’s monochromatic pencil drawings with a bit of collage, I knew I wanted to capture the feeling of her drawing while maintaining the simple palette. 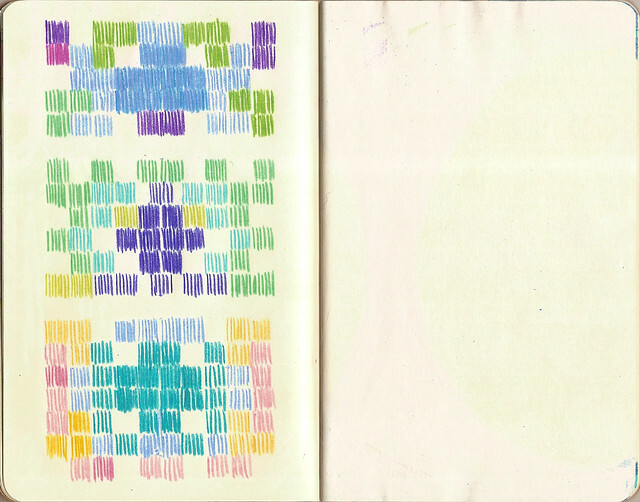 I painted radiating patterns with gray gouache. I worked intuitively, not sketching beforehand. Well, I admit, I had done a few similar paintings before this, but each always turns out so differently. I was really excited about the added element of surprise as I focused on the feeling of Jessica’s drawings while I painted, instead of thinking about form or composition. 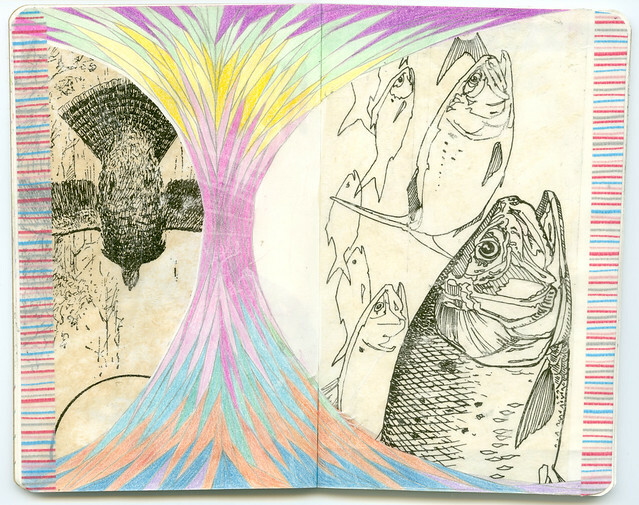 The end result are two spreads that harmonize incredibly well. I feel happy and soothed every time I see these. Lastly, here are the pages that I’ve started for Jessica to soak up and find inspiration from. Finally I had a chance to use rice paper! I drew graphite lines on the translucent rice paper sheet and used it as a background frame for the colorful blob prints. I made the prints by adding little globs of gouache to the surface of some card stock and smushing another sheet on top of it. Voila! Two prints! They are mirror images of each other, but I flipped one upside down, just cause. 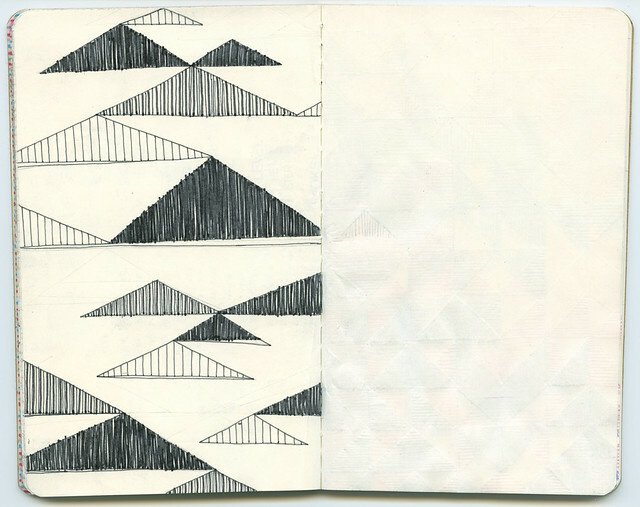 It’s no secret that I love triangles and lines. I had these images in my head for a while, and I sketched some of them out in a separate sketchbook. I chose a couple that I liked particularly well as a starting point. I first drew the shapes in the Patterns & Paws books with pencil, then went over the lines with pen, and finally added the line texture with pen as needed. 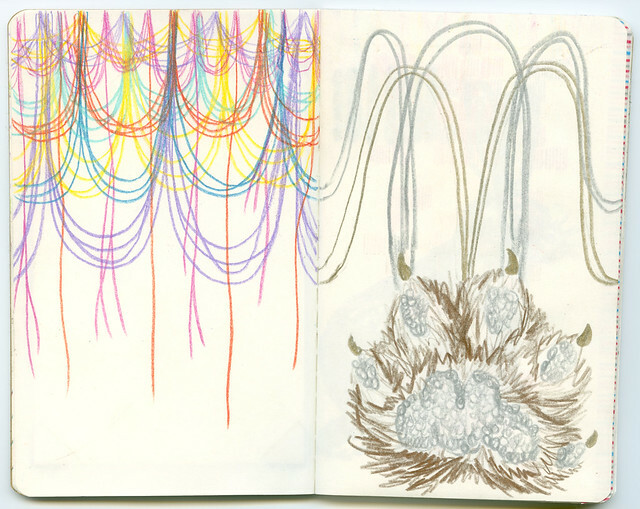 These final two spreads are the pages where Jessica and I both create in the same space. On the previous similar spreads, we both left a lot of space for the other to work with. While these were all successful pages, I wanted to push things in a different direction. As you can see in the images above, I created two drawings that pretty much cover up both pages. I’m hoping it’ll push Jessica to cover over parts of my drawing, or just find a new way to interact with what I gave her! I’m very interested to see what she’ll add! A little birdie told me that Patterns & Paws may already be on its way back to me, so I won’t have to wait long to see how this project continues to evolve. Do you have a favorite spread so far? Is there an, as yet, incomplete set of pages you’re particularly interested to see complete? I’ll share more as soon as there’s more to show! A few weeks ago, I got a nice surprise in the mail from Jules Young; After completing her page, she sent me the collaborative accordion book that is traveling around the world for many talented artists to make their mark on. I’m the 4th artist to get the book. Valeria Poropat started this project and so far it has traveled around Europe before making its way to me. I was very excited and inspired after seeing the first three panels, and quickly started brainstorming ideas of my own. There was no set theme, so I thought about the project itself, and the phrase, “from here to there and back again” popped into my head. As I thought about it some more, I decided it made more sense from my point of view to switch the order of “here” and “there” to read, “from there to here and back again”. I liked the sounds of it, and started sketching out my idea. 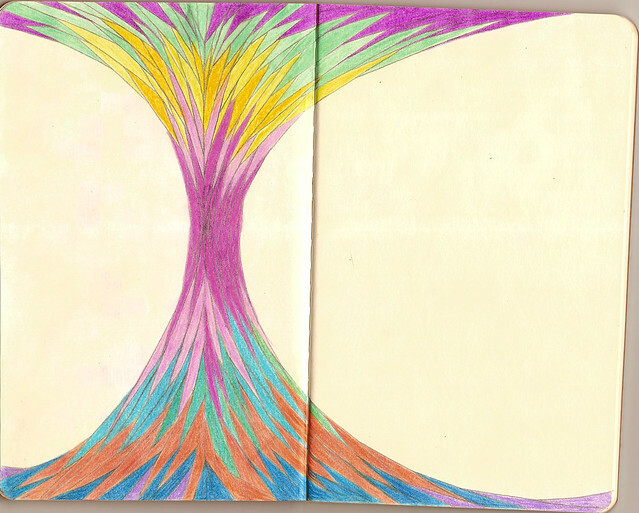 After a few rounds of sketching, I came up with a composition that would work for the narrow orientation of the pages. I made a few quick copies to try out different colors. When I was ready to transfer my sketch to the book for the final drawing, I ended up using a window as a lightbox, just to get the basic lines and composition that I’d already worked out in place. Once I finished tracing, I drew the rest of the smaller elements, and drew over everything with an ink pen. I then freehanded the remaining details in pen. The last phase was adding color, which I took my time with, making decisions along the way. At one point the ribbon was going to be blue. I also considered pink, but in the end, I zeroed in on a cream color with accents of green, and I really like the natural feeling it gives the piece. From left to right, the artists that have so far added drawings to the book are Valeria Poropat, Tricky Tanya, Jules Young, and me! There are quite a few pages and artists left to go, so I’m really looking forward to see what each artist adds! I have always been interested in the idea of collaborating. Not with the enemy, but with other artists. It just seemed like such a cool concept to work with another person to create something unique & unexpected, but I never really knew how to go about it since I’d never done one before. Then along comes the ever so talented Jessica Gowling. 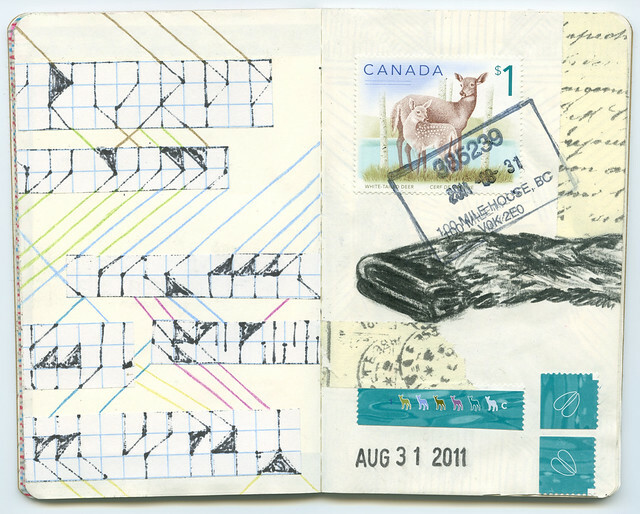 I met Jessica on twitter months ago, and shortly thereafter we started exchanging mail art. Much to my delight, one day she invited me to work on a collaborative project with her! Well, when I say invite, it was more like, “I’m sending you a project for the two of us to work on, and I’m not telling you what it is so it will be a surprise, and you better say yes!”. Haha! How could I refuse? Seriously though, I was super excited at the prospect of working on my first ever collaboration, but I was also really flattered that such a talent would single me out for something like this. We had to wait for what seemed like eons for me to finally get the project. I didn’t even know what I was going to be getting in the mail since it was a secret. We were both worried it had gotten lost on its journey, but it turns out there was a postal snafu, and after they kept if for about a month, they sent it back to Jessica because it was missing mere pennies in postage. Once it was sorted out, and I got it in hand, I was amazed by the drawings and the print she’d started off the project with. I was also really impressed that this was going to be an ongoing collaboration–such a great idea. I love the fact that it will continue to evolve with each exchange, and that we can both look forward to being surprised and inspired in new ways each time! 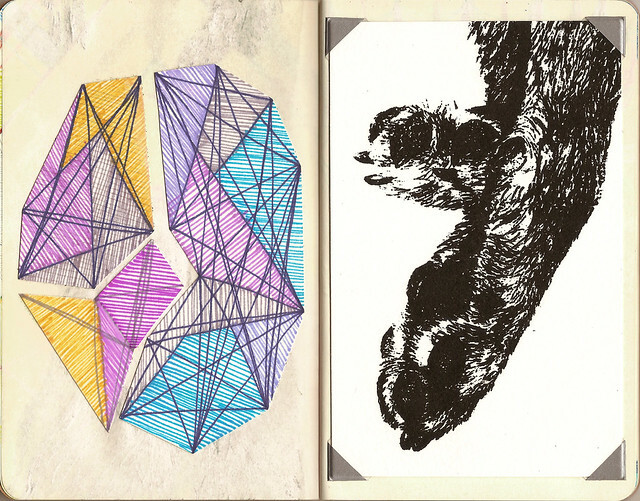 Jessica starts off the collab with paws on the first 2 spreads on the RIGHT pages only. 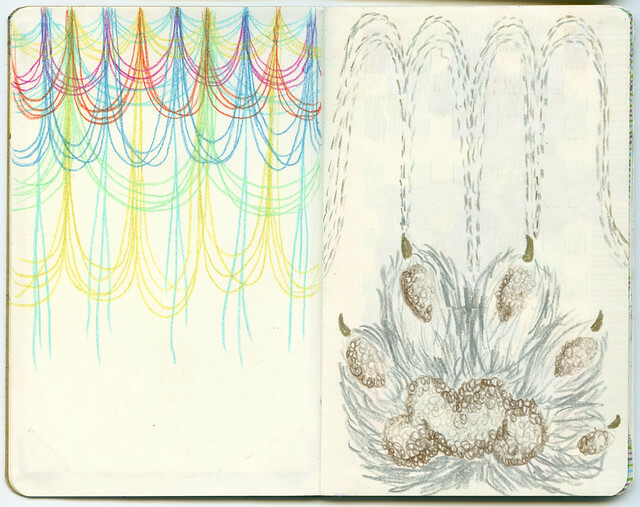 Anika fills in patterns on the LEFT pages of the first two spreads, taking inspiration from Jessica’s images that are on the RIGHT. 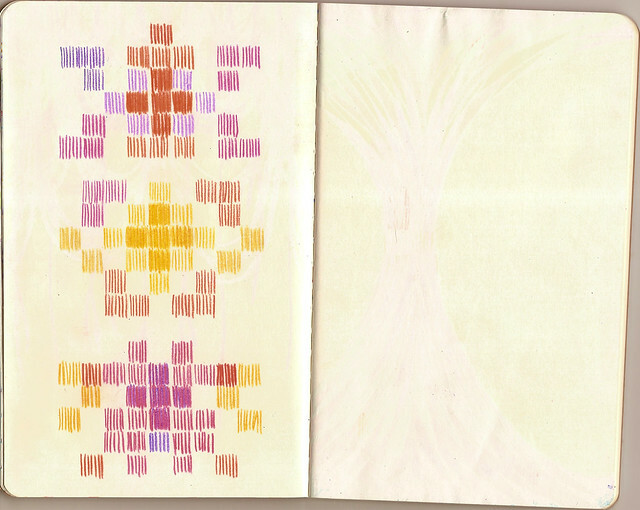 Anika fills in patterns on the LEFT pages of the next two spreads, which can be anything, leaving the RIGHT side blank. 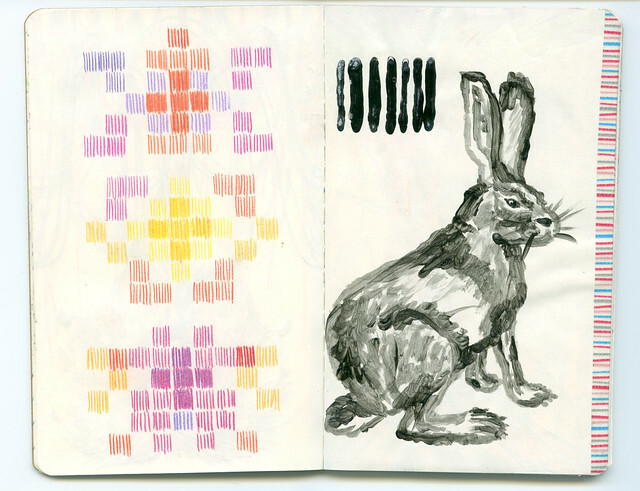 When Jessica gets the sketchbooks back, she will fill in the empty 2 RIGHT pages with images inspired by the patterns on the LEFT. 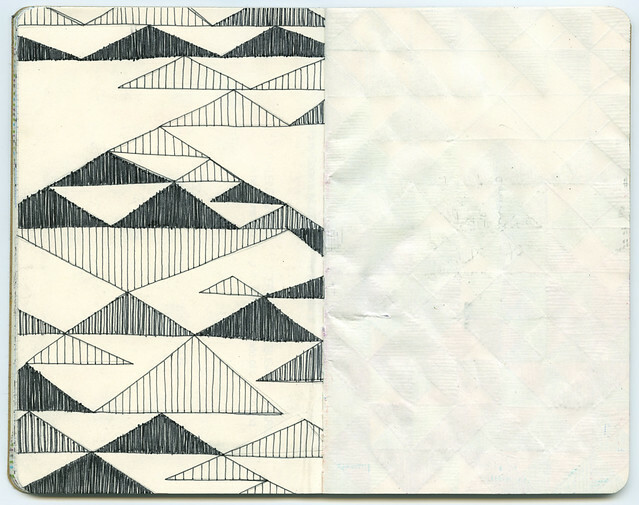 Anika fills in the following spread on both RIGHT & LEFT sides. 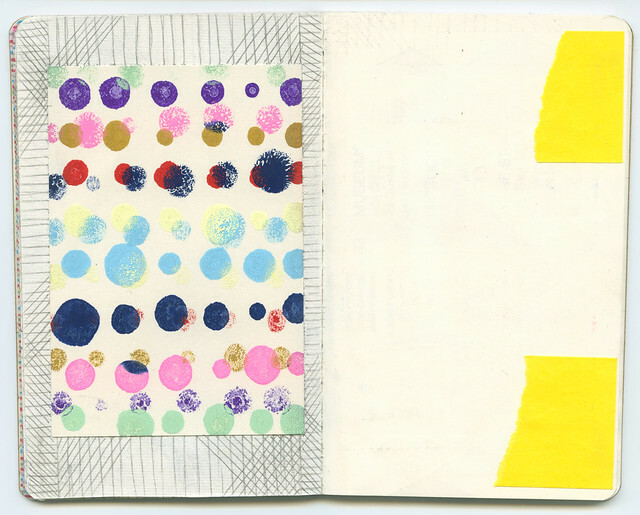 Jessica will also add to this spread on both RIGHT & LEFT to create an intermingled collaborative spread. 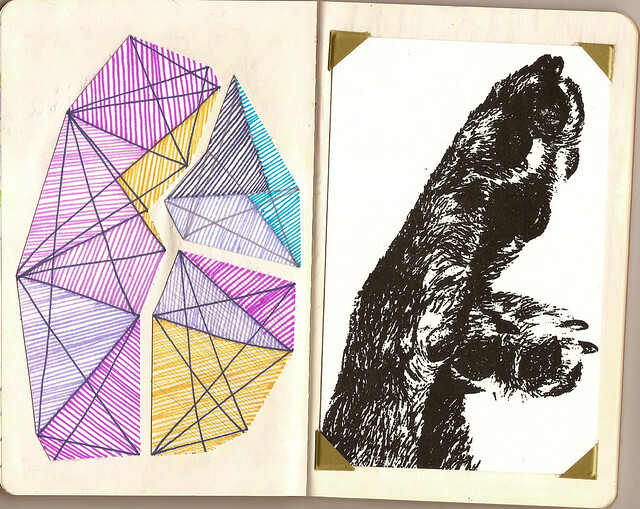 Jessica will then fill in the RIGHT pages of the following 2 spreads with paws, leaving the LEFT page blank for Anika to fill in. 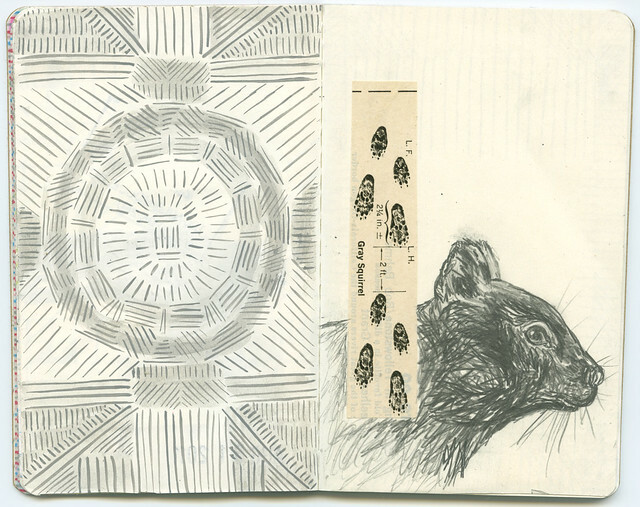 Jessica will then skip 2 spreads, and on the 3rd spread add paws to the RIGHT & LEFT pages for the next mixed collaborative spread, and so on. Probably sounds complicated right? Well, it’s really not! Take a look at the images below, and maybe that will give you a better idea about how things are arranged. First up is Volume 1 of Patterns and Paws, which I believe is the volume I’ll be keeping. My creative process usually involves taking in inspiration and letting it simmer for a few days, but it wasn’t long before I had my first ideas, and the rest flowed easily from there. Isn’t the chipmunk Jessica drew the cutest? When creating this pattern I thought about directional movement, gathering, piles, and nooks and crannies. This “paw print” is one of my favorite prints of Jessica’s, and I was super excited that she included it for the second spread. I really love the shape made by the paws, and I also love the dimensional quality of the print framed on the page. I decided to work with collage using thick bristol that really pops out from the surface, and created a very abstract interpretation of the shapes of the paws. Do you see it? This was the first spread where I could do whatever I wanted. I think initially I’d planned to paint this design with gouache, but I was so engrossed in the process that I started using colored pencils before I remembered my original intention. As it turns out, I really like the texture of the pencils, especially for the lines that are hanging down and taper slightly at the ends. This is based on a motif of swooping lines that I’ve created before, but the variety of colors, and the use of colored pencils add a new feeling to this pattern. This is a new style of pattern that I created for the collab. Is it wrong to admit that I’m kind of in love with this idea and pattern? Because I am! After completing the previous spread of swooping organic lines, I wanted to do something a little more geometric, while maintaining a hand drawn feel. In a way it’s a simple drawing, but I find the slight variations in color and thickness of the lines work together to create a really appealing design. I found this spread to be a challenge. I actually had the idea for this pattern and its shape in my minds eye, but had to do a bit of sketching outside this book to work out the details. Because I knew Jessica will be adding paws to this spread, I thought it was important to maintain some whitespace for her to work with. 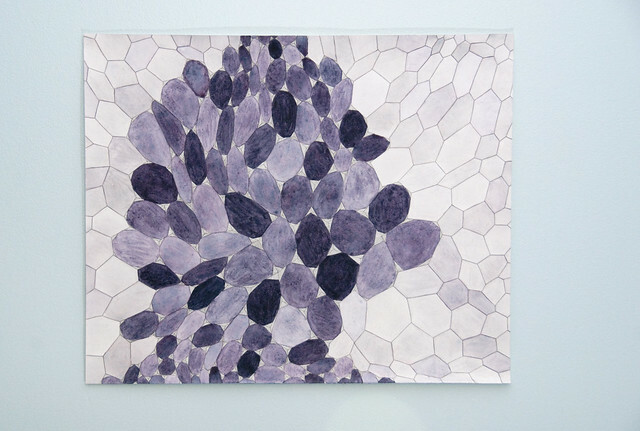 After seeing some work by Anna Jane Searle, and a comment Jessica made about it, I realized I could have filled the page with pattern, because Jessica would still have the opportunity to alter it by drawing, painting or collaging over whatever I created. Learning as I go! The concepts I had in mind when creating this pattern were mountains, caves, slow growth, endurance, cycles, formations, crystalline structures, energy and flow. I’m really interested to see what Jessica will add to this! Next up is Volume 2, which Jessica will be keeping, if I have it right. 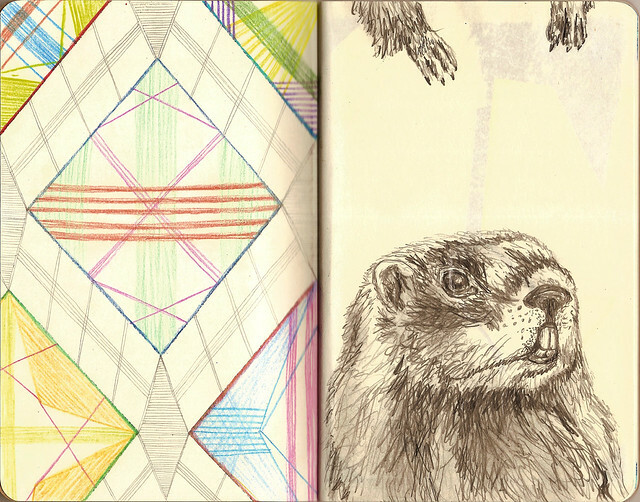 The first spread is similar in that Jessica created another pencil drawing, but the composition and the feeling is quite different and features a marmot instead of a chipmunk. I created a pattern that was loosely based on the composition of the drawing, while keeping in mind these concepts: connection, same and different, approach, warning, surrounded, unexpected, and continuation. 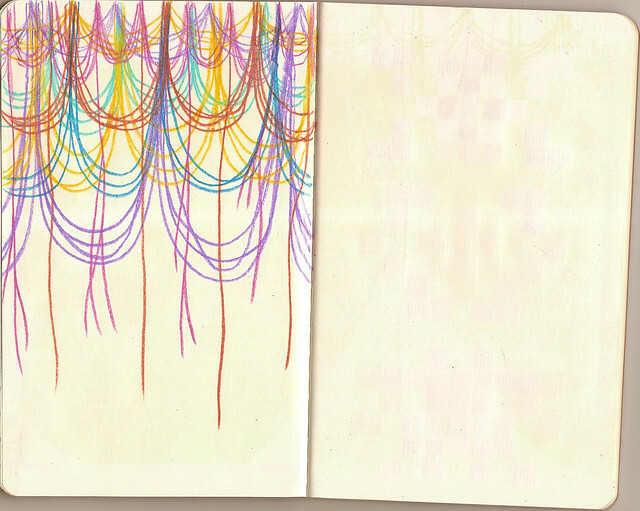 I used the same basic idea for this spread as for the one in Vol. 1. As you can see, the orientation of the paws is flipped, so I flipped my composition as well to relate to the shape of the paws. I also used the same idea for a swooping pattern on this page, but I’ll mention that I chose colors intuitively for the individual volumes. I approached the same idea for a pattern here as well, although the colors are different, and each of the three designs are a little more substantial than the similar spread in Vol. 1. Why? I’m not sure, it just felt like that’s how it was supposed to be! 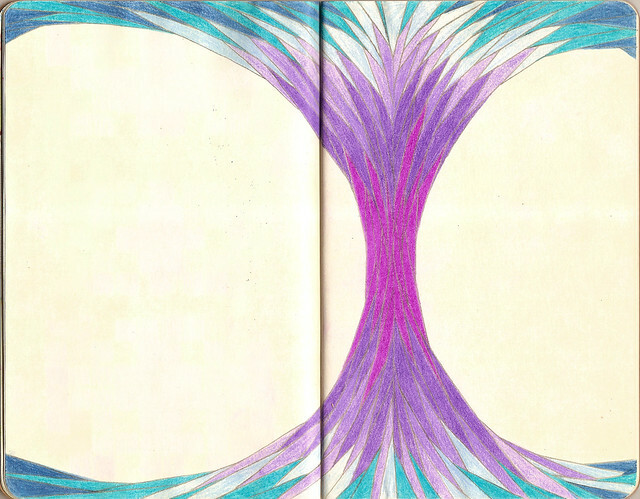 I used the same idea for both collaborative spreads as well, but again chose colors as I was working, for a result that has quite a different feeling. So there you have the first round of my very first collaborative project! Isn’t it exciting and awesome?! 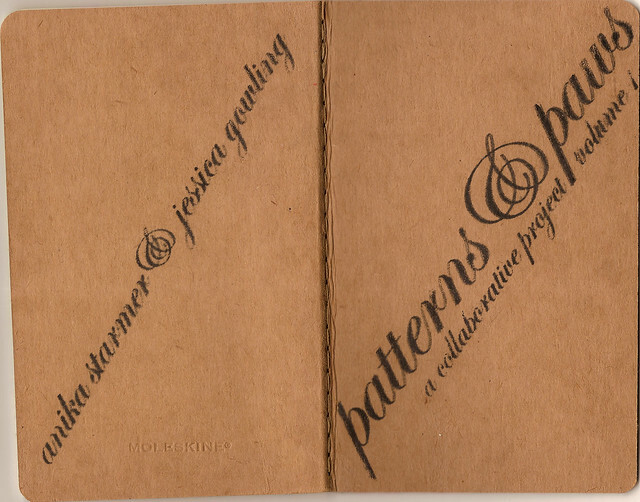 If you have a little more time & want some more info about this collab, I highly recommend checking out the very first post about it that Jessica wrote after I’d finally received the sketchbooks in the mail. She took actual photos of the sketchbooks, and also discusses the originating idea for this collaboration intelligently, so it gives you a good idea of what the books look like and the intention of the project. Plus you can see the other goodies she sent along with the project! 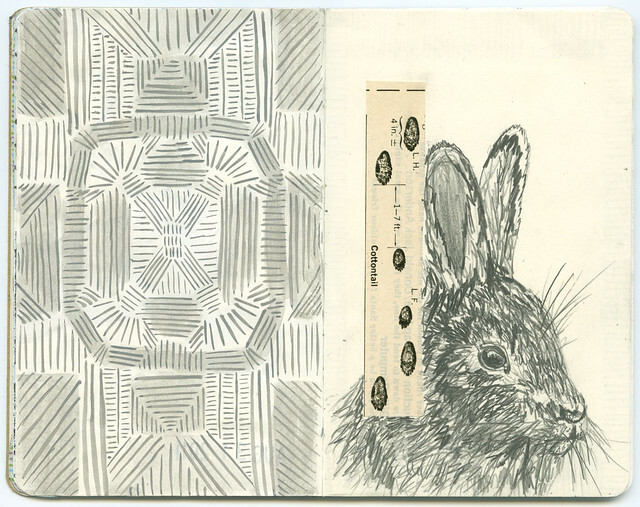 Currently Jessica has the sketchbooks and is no doubt coming up with awesome art to add. I’ll be posting about this project as it progresses, and I hope you’ll follow along! **edit** Since posting this, Jessica has also created a post for this stage of the collaboration on her blog. She again photographed the books side by side, which offers a unique view of how the books relate to each other. I also just think it’s fun to see the corresponding pages/diptychs next to each other. After hanging up all the work I framed at Metropolitan Cafe, I was 99% satisfied, except for one area where the triptych seemed too small for the prominent space above the fireplace. I decided to make a larger drawing to hang in its place, moving the triptych on the wall that’s to the right of the space shown in the image above. I started working on the new drawing the very night I got home from hanging the show. I started by drawing a grid on some smooth drawing paper with a pencil (and a ruler of course), and then drew the outline of the circle with the help of my trusty compass set. After drawing the grid I actually erased most of it, leaving only a hint of the lines, just dark enough so I could make out the grid while I was adding the colors. I started with pink. Unfortunately the pencil lead kept breaking, so before I knew it, the pink pencil was down to a little stub. Luckily the peach color in the set was very similar in tone, so I switched to peach to finish the first layer. With the first color finished, I started the next one: chartreuse green. Adding a new color is the best part of these drawings because that’s when I get to see how the colors will interact as they are layered. Once the chartreuse was finished, I used true green to start the next layer. I took one more in progress photo when I finished the true green layer, but then got so wrapped up in finishing the drawing that I forgot to take any more in progress pics! Instead I took a photo of all the colored pencils I used for this drawing, which include those I’ve mentioned, plus aquamarine, carmine red, magenta, and violet. 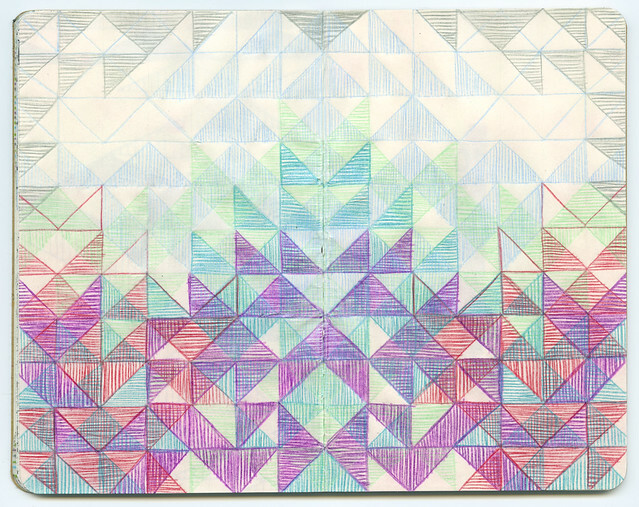 When my mom saw the final drawing she said, “it looks like a kaleidoscope”. I think that’s a great observation, so I’ll be calling this series “kaleidoscopes” from now on. Before I could snap a photo of the finished drawing, I framed it and whisked it away to Baltimore to add it to the show. While I was at Metropolitan, I took a photo of the framed drawing. I wish I’d taken a wide shot of the room so you could see the difference now that the triptych has been moved. I’m sure I’ll visit the cafe again soon, so I’ll update this when I get the shot. I enjoy taking “in progress” photographs of my art as I’m making it, and sometimes I’m very good about stopping for a few minutes to take a quick photo. At other times I get completely engrossed in the art and neglect the documentation. I’m learning that, like with most things, there’s an art to capturing a comprehensive view of art work in progress. In my last post I shared the outline drawing I had started and planned to paint in. As you can see, the painting is now finished. I had fully intended to take in progress photos but didn’t get around to it until the painting was finished. Oh well. I started another painting immediately after finishing the last one, and before I had a chance to photograph the outline, I already started painting it in. Oh well again. My intention is to photograph this at a few more stages before the final, but we’ll see what happens. I realize that I have to be focused on my goal before I start painting. If I’m going to stop at intervals to take photos, I really should have my camera out and a photo area cleaned up and ready before I sit down to paint. Otherwise the effort of doing so while I’m already painting usually feels like too much of a bother. I’ll try this out to see if it will yield more step by step photographs. Wish me luck! Another thing I realized while painting the pinks and reds, is that I think I’m trying to use watercolor more like gouache. I really laid it on thick, trying to get bright, vibrant hues, and I know that traditionally watercolor is intended to soak into the paper more. Maybe I just still have a lot to learn, or maybe I should stop painting on bristol, but I don’t necessarily mind the way I’ve painting. I like the texture of the thicker paint, but I wonder if there’s a more economical way to achieve similar results. I haven’t used acrylics in a while, and even when I did it was for color studies in college, so maybe I should unearth them, try them out again, and see if they will fit the bill. I have a very high-tech method for photographing my art that is too large to fit on my scanner. I tack it on the wall, or more often, lay it on the floor and zoom in my telephoto lens, bending my body into an uncomfortable arch while trying to get the edges of the paper as square as possible in the view finder. It’s no easy task, and with a “kitty helper” it’s even more challenging. My cat mojo wants nothing more out of life than to sleep on my art. The moment I pull out my pens and lay paper on the table, Mojo invariably appears out of nowhere, ready to snooze in the middle of what I’m doing. Paper on the floor is even more irresistible, so of course Mojo was nearby when I photographed my most recent in-progress art. Even after zooming in, he makes his presence know. I took these photos to see how my new flash would work to photograph art. It makes a big difference; the light is a lot more even than I could have gotten from my on-camera flash or light from the window. I had to brighten them up a lot in Light Room, so I’ll probably tweak my set up a little more to get brighter out-of-camera shots, but so far so good. I’ve been drawing more calendar sketches in my spare time. I’ve had some new ideas, and wanted to hone some of the original sketches as well. I’m really happy with the redraw for February, and I like the new drawing for September. The November texture is also pretty interesting, so there’s potential there, even if I did run out of space on this sketch. Last night I added color to some of the existing sketches. I’m not a big fan of the color. I was a lot more fond of them when they were black and white line drawings. There were only two months that I added color to that I liked: a new drawing for May, and the existing September sketch. Color works for those particular drawings because they were relatively simple and repetitive and achieved balance with the surrounding white space. The color functions as an accent and doesn’t overwhelm the piece. Taking into consideration some of the sketches where color doesn’t work, my best choice is going to be to stick with black and white only and rely on line details and texture to add interest. It was worthwhile trying out color on these sketches, even if the result is that I decide not to use it. I love color, so it’s often not a conscious choice on my part to incorporate it into my work. Although I’m a little surprised to find that I prefer the drawings without color, I’m also a fan of the simple elegance that’s possible with the use of only black and white.